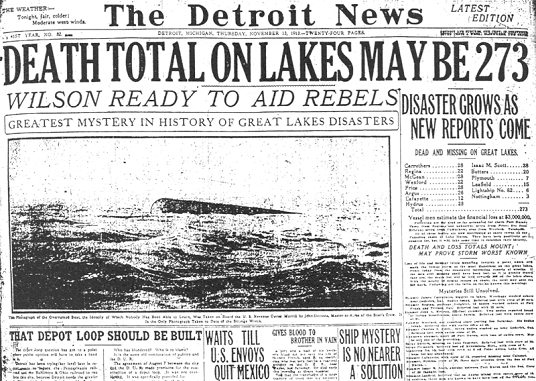 31 cargo ships and barges stranded, twelve ships sunk with crew, 253 sailors drowned — that was the the toll of the most disastrous storm ever to hit the Great Lakes. The first November gale of 1913 started on western Lake Superior when warm southwest winds sped up on Thursday the 6th. On Friday morning a cold front started over the lake, bringing northwest gale-force winds behind it. By midnight Friday the gale had battered and pushed aground several ships, leaving shivering crews awaiting rescue. With a powerful high pressure area in western Canada wheeling arctic air southward, the cold front and its trailing gale marched over the lakes, reaching Cleveland at 3 A.M. Sunday. 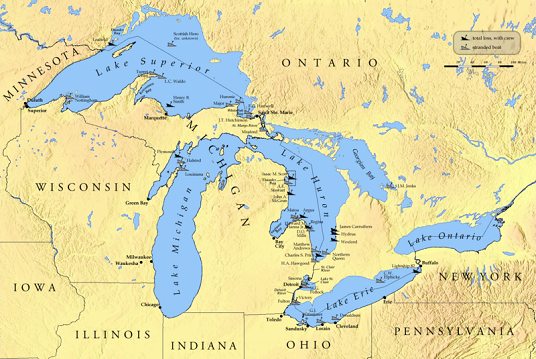 On Lake Huron that Sunday many sailors expected the gale to end soon, after a typical three day blow. But on Sunday afternoon a low pressure system from Virginia entered Lake Erie. Feeding on the cold air from the front, the low deepened and strengthened. The low may have further strengthened by getting under and in phase with a sharp southern dip in the jet stream. So the northwesterly gale, with its 48 mile-per-hour (77 km/h) winds, did not blow out. Instead, its winds went to the northeast and sped to near-hurricane force at 70 miles-per-hour (113 km/h). The storm belted land and lake, from Superior to Erie, with wind and snow, and came to be called the “White Hurricane”. On southern Lake Huron, the evening of Sunday the 9th, sailors found 35-foot (11 m) waves, blinding snow, and winds gusting to 90 miles-per-hour (145 km/h). On Saturday the 8th the ore boat Charles S. Price shoved off at Ashtabula, Ohio, into Lake Erie with a load of coal and without its first assistant engineer. Milton Smith had chosen to skip the last voyage of the 1913 season — and any early November gale that might arise — and had taken the train home to his wife and children in Port Huron, Michigan. After midnight on Sunday morning, as the Price steamed up the St. Clair River and past Smith’s house into Lake Huron, a gale was blowing in from the northwest. That afternoon sailors on the downbound (south-going) H.A. Hawgood saw the Price fighting its way upbound as it passed. The Hawgood had been heading into the storm north of Saginaw Bay, when it turned around to seek safety at the St. Clair River and let the gale blow itself out. But, instead of blowing out, the gale became the White Hurricane. By dark the snow “got so thick we couldn’t see the smokestack”, reported the Hawgood‘s captain. “The seas went right over the pilothouse.” Later, the Hawgood ran up on a beach at the southern end of the lake, and its crew survived. Likely the Price also turned and headed back toward the foot of Lake Huron, where it would have had to turn again to avoid running aground. On that final turn, the Price may have gotten caught sideways in a deep trough between the waves, and rolled. Its upturned hull floated for several days, and the papers speculated on the identity of “the mystery ship”, until a diver went down to read its name. On Tuesday the 11th, after the storm had quieted, seven bodies of sailors from the Price washed ashore in Ontario near Port Franks. On Thursday, a week and a day after leaving the Price, Milton Smith boarded the train in Sarnia, and headed for the makeshift morgue to identify the bodies of his shipmates. Another ore boat upbound on Lake Huron that Sunday, when the White Hurricane raged, was the George C. Crawford. The boat fought the waves to north of Point Aux Barques with winds “blowing great guns”, according to Captain Walter C Iler. Waves rushed over the deck and boilerhouse through a broken skylight into the engine room, smashed the ship’s galley and drenched the crew’s sleeping rooms. So, like the captains of the Hawgood and the Price, Captain Iler decided to turn his boat around to seek calmer waters. While heading back down, Iler could make out the passing upbound ore boat Argus through the snow and waves. He later recalled what he saw just after the boat passed by. “The Argus seemed to crumple like an eggshell,” he said. “Then, she was gone.” Bearing that horrible image, the crew of the Crawford had to tend their boat as it ran fast with the wind and the mountainous waves towards the foot of Lake Huron. “It snowed for a solid twenty-six hours,” Iler later recalled. “We hadn’t seen a thing, but were guided by the sounding machine. It gave us excellent service.” Not being able to see to find the St. Clair River, Iler decided to turn around before running out of lake and ripping into the shoals. But the boat got stuck in a trough and could not climb out, so the captain ordered the anchors thrown. The anchors grabbed and the ship came around, but soon the anchor chains snapped, and once again the storm pushed the Crawford towards the shore. Around 2 A.M. Monday a lull in the wind allowed the boat to turn, and it once again battled upbound on its original course towards the Soo Locks. On Tuesday the battered boat reached the St. Marys River that leads to the Soo. In the calm, the crew wielded steam hoses to melt the thick ice off the deck, and found something stunning. Hundreds of rivets were missing, and cracks ran across several of the inch-thick steel deck plates. The crew might have pictured then how their own boat could have crumpled like the Argus. Records show that the Crawford did not finish its last voyage of 1913, but turned back to Toledo for repair. And in the spring of 1914 it set out again. A small detail in the above account. The boat that ran up on the beach was the H.B. Hawgood as opposed to teh H.A. Hawgood. IT was run agroun intentionally by the Wheelsman Edward Kanaby to prevent the captain (May) from taking the boat into deeper water. Young Kanaby strained to make out the patch of beach that his captain had seen, but it was invisible through the snow. Instinctively, the youthful wheelsman turned the wheel, but there was no open water to be found. As the ship fought to respond to its rudder the men in the pilothouse could sense breaking waves all around. The motion of the deck was different beneath their feet. An instant later the ship’s forefoot struck the bottom, bounced once, then again. Suddenly, the violent motion of the storm disappeared. The Hawgood has hard aground. Until he died, Edward Kanaby always told the story that he disobeyed his captain’s last helm command. Kanaby said he turned toward the beach in a young man’s frightened effort to escape the gale. Perhaps he did. It probably mattered little. The Hawgood was too close to shore to have been steered to safety. The ship was hard on the beach before the rudder could have had any effect.